Complete your dining area with this stunning white oak 5 piece round dining set from RC Willey. The unique table base adds a fun and contemporary look to the set and pairs perfectly with the rustic oak upholstered dining chairs. You'll love gathering with friends and family around this traditional yet contemporary dining set. Set includes table, four chairs, and a bonus 42" lazy susan. 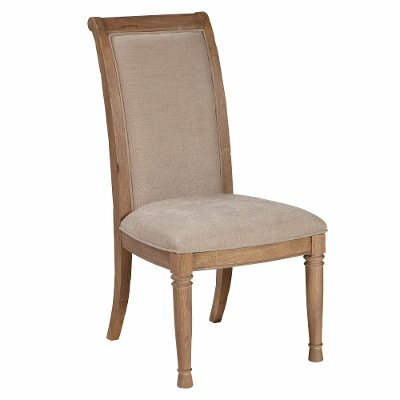 Take your dining space up a notch with this lovely upholstered dining chair from RC Willey. This classically styled chair features a white oak finish and is beautifully complemented by the rustic oatmeal upholstery.